Ryan Bernal & Danny Sheridan for a pair of CRA Races this weekend! is a race team primarily running 360 and 410 Sprint Cars. JFM, Inc. also races Midgets and Go-Karts. The main series’ they compete in are the USAC West Coast Sprint Car Series, USAC CRA Sprint Car Series and the USAC Western Classic Sprint Car Series. We also participate in several national events, such as the Chili Bowl Nationals and the AMSOIL USAC National 410 Sprint. George Ito, Keith Ford and Josh Ford are the principal of the team and Jimmy May is the team’s award winning crew chief working with Mikey Evans and the team to get the #73 cars set to run hard for every race! The Josh Ford Motorsports team has began in the late 90’s running some of the best Sprint Car drivers in the business! JFM goes 1, 2 in the CRA Feature in Perris! Danny Sheridan WINS and Ryan Bernal 2nd!! Fast cars and proficient drivers make for good times at the race track! It was another great night with Ryan Bernal and Danny Sheridan. Sheridan qualified 5th, took 4th in his heat and started 2nd in the A Main. In the Feature just dizzy with cautions Danny found his way to the front in the 7th as he inherited the lead from Damion Gardner and Sussex taking each other out. He did not lose the lead from that point, though he was running side by side with his teammate and winner of last night’s CRA feature, Ryan Bernal. 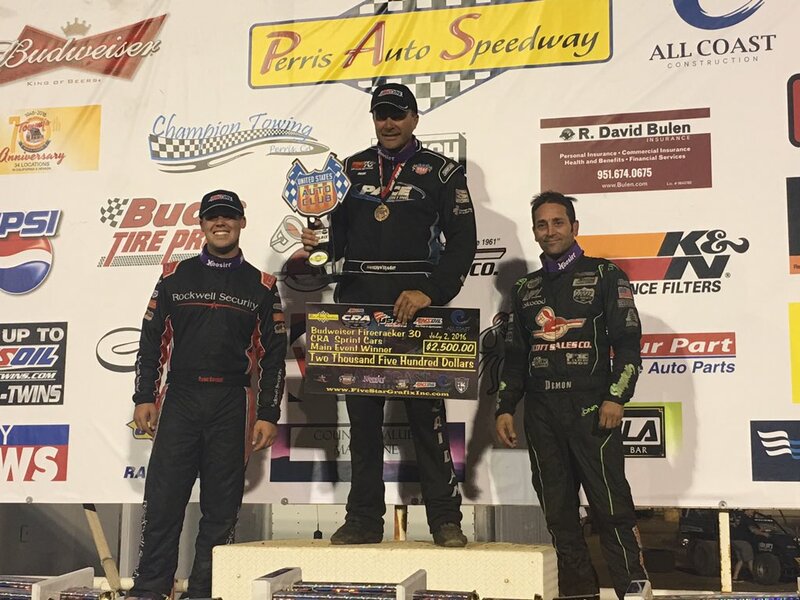 Ryan Bernal had a great weekend and night in his own right, almost making it 2 in a row! He qualified 9th, won his heat from 4th and nearly won it all again but gave way to teammate Sheridan. Great night of racing! Look on here soon as will post our next race very soon. These dates are sublect to change. If we do change something we will post on our social platforms as soon as we know and are able. Bernal Wins and Sheridan 5th in Santa Maria!! It was exciting to see Ryan Bernal back in a sprint car after missing first part of the season going to Fire Academy. Bernal, out of Hollister, CA did what he does and it was fun to watch! He qualified 6th of the 26 CRA sprints and finished 2nd from 5th in his heat. In the 30 lap main Ryan quickly got up into 2nd and then worked on leader Brody Roa. He charged past Roa in the 9th lap and had only one challenge from Damion Gardner around the 26th lap where they were almost side by side. Bernal won that battle and the race!! Danny Sheridan put on quite a show tonight as well. Danny qualified in the top 10, finished 4th in his heat and finished in the top 5 in the 30 lap feature. Sheridan is quite a competitor and was great to have him putting up a strong race running with us again! We couldn’t do it without the incredible support from these guys… Walker Performance Filtration, Sun Valley Ag Transport, Pacific Coast Maintenance Service, CSI Shocks, King Racing Products. Thanks! Thanks everyone for coming to the track and we will post our next race we will be at very soon.